I’ve officially become a jammer (oh geez). I spend my days planning my next jam-making session and scour the local fresh fruit and vegetable stands for the best in-season fruits. I’ve slowly acquired all sorts of different sized jam jars and bottles and I’m slowly becoming more comfortable with the whole sterilizing process that goes into canning and preserving jams. I’m still terrified of poisoning my family or friends with botulism but my fear is waning slightly. 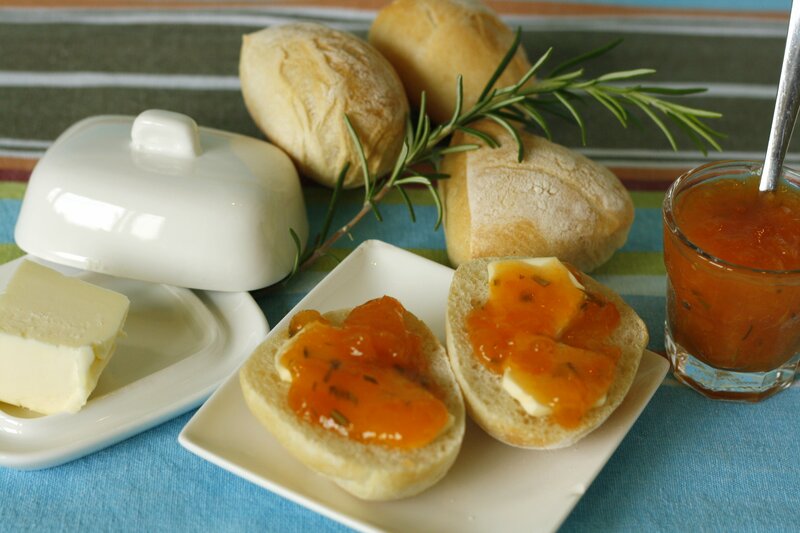 Last week I bought some delicious looking apricots from the local produce truck and decided to make Apricot Jam with Rosemary (found on my all-time favorite preserving site Food in Jars). Seeing as I almost didn’t survive after making the Cherry Rhubarb Lavender Jam a few weeks ago I had to enlist the help of my husband to do the initial cleaning, pitting and chopping of the fresh apricots. But once they were safely in the Le Creuset and I was gloved, I was ready to start the whole process ( I was even tempted to don some swimming goggles but was terrified of some of the locals catching a glimpse of the crazy Canadian making jam WITH GOGGLES!). This is a quick jam recipe and I have to say it has such a unique end result with the addition of rosemary. It’s sweet with a distinctive savoury background that really makes for a new experience for your taste buds. It might even initially confuse them. But that’s a good thing. For lunch today I made this sandwich above. 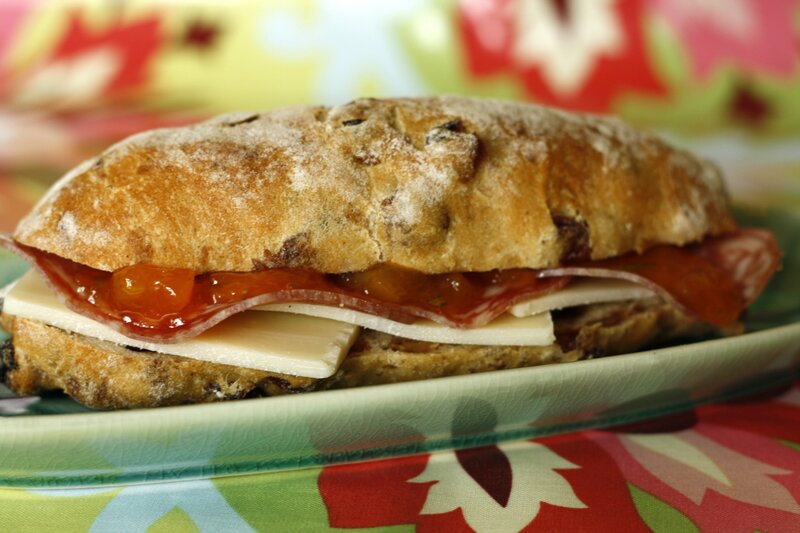 Rustic raisin bread with thinly sliced Gruyere cheese, salame di Parma and a good layer of the Apricot Rosemary Jam. It was more than delicious (although I’m pretty sure the kids would bolt from the table if I tried to serve them this). 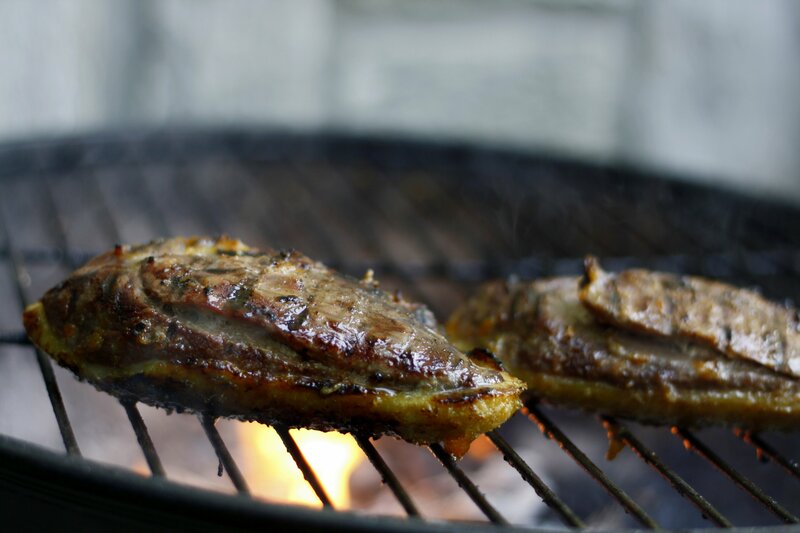 This past week-end I marinated magret de canard (duck breast) with this jam and some garlic and barbecued it and it turned out to be an absolutely delicious combination. 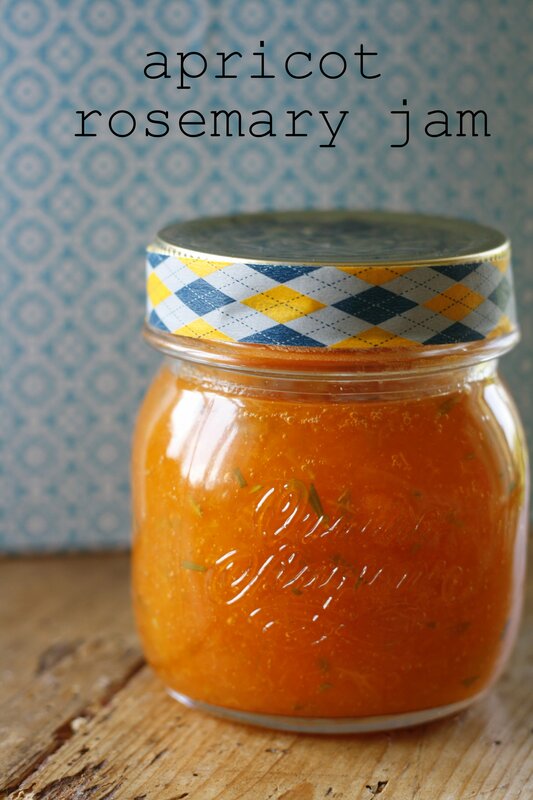 Please pop over to Food in Jars for the recipe! I’m new to jam-making, and I still do the freezer method because I’m terrified of poisoning everyone who eats it. Did you use any particular resources to overcome your fear of the sterilizing and what not? I don’t have any one resource for the sterilising but I’ve gone on numerous sites to read any tips and advice (and as I’ve said before foodinjars.com is great for anything to do with preserving and conserving). For this jam I boiled the jars for at least 30 minutes, then I poured the jam in the jars and sealed them then boiled the jars again for a further 10 minutes. It was labour intensive! Hey, I’m sure your jam is great but I just gotta comment on your beautiful photography! Great job, love it. Looks delish! I’m not a jammer, at all. I guess I should start trying and having fun with all the exotic fruits South East Asia has to offer! Looks amazing! And the ribboned jar lid! NICE TOUCH! Hmmmm that sandwich looks yummy! I wasn’t aware though that you have to do this time-consuming sterilizing thing. Wow! Jillian in Italy Interview by Classic Play!